While Marvel Comics may have the advantage in terms of identifiable characters, there's one area where DC reigns supreme: superpowered apes! Now armed with a power ring and the knowledge of the identities of all the members of the Justice League, supervillain Gorilla Grodd is more dangerous than ever. Grodd is just one of a handful of freaky power-monkeys running around the DCU: there's Monsieur Mallah, the gay French gorilla with a penchant for firearms; Titano, the Kong-sized ape with Kryptonite eyes; the vampire Nazi gorillas of the Primate Patrol; George Dyke, Gotham City's gorilla mob boss; King Krypton, the Gorilla of Steel; Detective Chimp; Congo Bill/Congorilla; and of course we can't forget the Ultra-Humanite. Special bonus fun-fact: hard as it may be to believe, we didn't make up any of those examples! There are plenty more, too. During the 19th century, an object from space crashed in Africa and imbued a gorilla tribe with hyper-intelligence and telepathy. Today, where it landed, stands Gorilla City, hidden from the world by mountains and technological illusions. And while most of the apes living there are content to ignore humanity, Grodd is much more of a criminal and conquerer. Though Gorilla Grodd is part of Justice Series 7, he's not based on Alex Ross' artwork - not the way all the other figures are, at least. 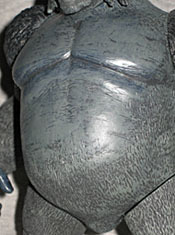 The head may be an attempt to copy Ross's art, but the body is a straight re-use of the Gorilla Grodd DC Direct released in October of 2001. That's not a bad thing, really, since an ape body is an ape body, but it is an unusual move for DCD. Some folks will probably be surprised by Grodd when they first see the figure: he stands 7" tall, which is the average height for a DC Direct figure. But as our own Poe pointed out recently, figures like Cy-Gor and the Kriegaffe have indoctrinated toy fans to believe that gorillas are huge creatures. In truth, they may be ferociously strong and weigh upwards of 400 pounds, but they only stand about 5'6" when they're upright. They also have the smallest genitalia of any primates, so maybe that's why they're always so angry. 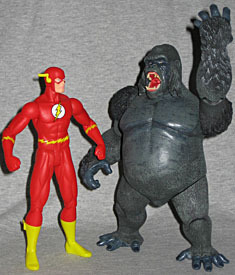 Grodd has pretty good proportions: his legs are short, his arms are long and he's got a fat belly. His fur is sculpted well, and the exposed skin has a different texture. This release has a new head - the original was fairly calm and collected, while this version has his mouth open in a huge bellow. He still has the inexplicable sideburns, though. Still, the teeth are individually detailed, and there are even little ridges on the roof of his mouth. Plus, he seems to have a uvula. If DCD had to make some minor changes to the old figure, this new head is a good one. The figure's articulation is a bit low for DCD, but not terribly so: he has hinge knees and elbows, swivel hips and shoulders, and though there's a little bit of movement in the neck, it isn't really a joint. When the hip swivels are lined up with the body, his left foot is raised off the ground. The toes are still in contact, so he still balances, but he's permanently striding forward. You can get his feet down flat thanks to all the joints, but you can't make him walk on his knuckles. 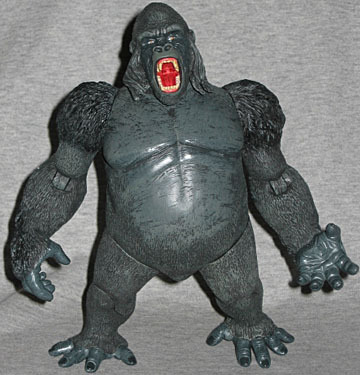 The 2001 version of Gorilla Grodd had two accessories: inspired by a piece of Art Adams' artwork for a Who's Who entry, the figure had a human skull and a pair of calipers. This figure doesn't get anything but the standard Justice display base, which means his oddly posed hands will look that much more blatant. Justice Gorilla Grodd is a pretty good figure. He's not as much of an "Alex Ross" figure as the others in the line, but since they've resorted to silly armored variants, that may be a good thing. I didn't like this Grodd when I first got him, but he's really grown on me, even with the DCUC2 BAF on its way sometime soon. If you already have the Grodd released in 2001, you don't need this one, but if you don't, well, what collection couldn't use more ape lovin'?